Funny thing about satire, to be at its best it most often has to be taken seriously. Poking fun and being serious can conjure opposite emotions, but satire, when done right, and especially if it is funny, can be hard work, with hours of bouncing ideas, only a few of which stick. But for an absence of about 100 years to let the Reconstruction cool off, satire has been a part of Carnival parades, at least a few of them. These days, the two krewes that are the best at it are Chaos, a descendant of the former Momus parade (1872—1992) that was a master of the barb, and Le Krewe d’ Etat (Known informally as KDE or simply “d’état’), a relatively new krewe which was no doubt inspired by Momus, but developed its own style, especially in float design. · Innovative throws: Blinking objects, especially KDE green skull. In a non-satirical gesture we can say that KDE is one of the krewes that does everything right. It is smart with an old style look yet modern humor. There are lots of good bands and marching groups. Oh, we should have mentioned. The krewe’s motto is Vivitie ut Vebatis; Vebite ut Vivatis. Which, of course, as we Latin scholars know, means, “Ride to Live; Live to Ride.” Or as the French might say, Vive le satire. A float entitled “The Dance Class” focuses on the allowable age and weight for legalized strippers. “American Gothic” shows the classic farmer and his wife as part of an angry middle class supporting Donald Trump. Radio chatter and obsessing over the Saints set the theme as Tom Benson promotes his then-newly acquired Dixie Beer. Obamacare lingered on life support. Walking figures of The Dictator (There is no king). There were real body blows in the NFL last season, and that was off the field, including the national anthem controversy, a pizza chain failing the political correctness test and declining ticket sales causing high-roller owners to lose money. “Dogs Playing Poker,” a classic fixture in man caves, shows big dogs in international politics gambling on our future. The krewe’s symbol, The High Priest carrying a torch. Jazz Fest Producer Quint Davis delights over a garden of earthly delights that includes long lines for beers and top dollar for VIP passes. Listed as “The Curators” a mostly handsome group (with one exception whose hat is too small) of Carnival observers comment on the season. 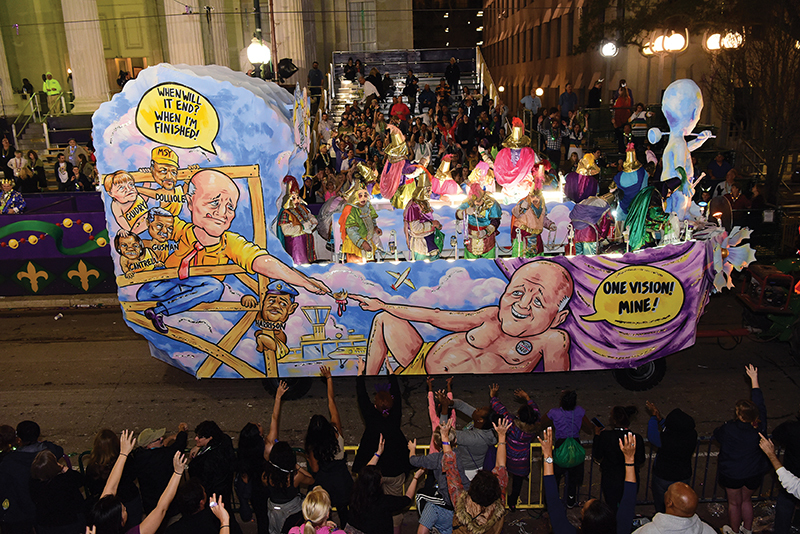 Float builder Blaine Kern sticks to his title of being Mr. Mardi Gras, while an angelic late Herb Jahncke (Royal Artiists) looks on.